Lillian Too (MBA '76), formerly Kim Lim, is the executive chairman of her own publishing and investment company in Malaysia. 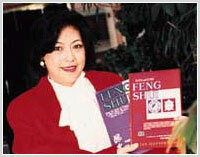 She is the author of eight best-selling books on the ancient Chinese science of feng shui (pronounced FUNG SHWAY), including The Complete Illustrated Guide to Feng Shui, available in the United States. Q: What exactly is feng shui, and why should a businessperson be interested in it? A: Feng shui is a method for arranging your living and work spaces so that you may tap into the positive energies in your environment. Based on factors such as compass directions and the locations of natural phenomena such as mountains and rivers, there are lucky and unlucky places and orientations for buildings; there are auspicious and inauspicious locations for rooms; there are even right and wrong places for objects in a room. The idea is to create harmony and balance. Architects in places such as Taiwan, Hong Kong, Malaysia, and Singapore factor feng shui into the design and construction of buildings, because its principles are widely known to make work less tedious and human interactions more harmonious, and to help individuals become healthier and businesses to flourish. Feng shui should be seen as an additional, low-cost management tool. Q: ...but an unconventional management tool. A: Feng shui is not magic, it's not superstition, and it's not a religion. It's a science, more than 3,500 years old, that's based on the ancient Chinese understanding of energy flows. Q: Give some examples of businesses that use feng shui. A: Two high-profile users are the Hong Kong Bank, the largest and most successful bank in Hong Kong, and the Marks & Spencer stores, probably the most successful supermarket and department store chains in the United Kingdom. The Hong Kong Bank has been especially successful ever since the commissioning of their new building in 1983. Q: What feng shui problems are commonly found in Western buildings? A: Long corridors, angular structures, protruding columns and corners, exposed pillars and structural beams - all of these create what we call "poison arrows," meaning that they shoot unfavorable energy at you. Q: What happens if your surroundings have bad feng shui? A: Depending on the specific problem, you might find that your relationships are full of quarrels and misunderstandings, your health suffers, you lose money, your business has a high turnover, or you're not getting new clients. The list can be endless. Q: What can you do to remedy bad feng shui? A: Aside from moving to a more auspicious location, there are many remedies, depending on the problem. You can shield yourself from a protruding corner, for example, by placing a tall plant in front of it. If your bathroom is next to your kitchen, which is very bad luck, you can hang a crystal between the two. You can also place symbolic objects in precise locations to counteract certain effects. Q: How did you become interested in this? A: Before I came to HBS(HARVARD BUSINESS SCHOOL), I was unable to have a baby. When I returned home to Malaysia, I moved into a new house my husband and I had built based on feng shui principles. I immediately became pregnant with my daughter. I concluded that my earlier problems had been caused by bad feng shui. That began my lifelong obsession with the subject. Later, I used feng shui to enhance my career prospects and the results were simply stunning - promotions, raises, huge perks, all beginning the year I rearranged my office according to feng shui. Q: How can a person learn more about this ancient science? A: The easiest way to start is by reading books. You can also consult feng shui experts, but it's not necessary. Feng shui is not difficult at all. Q: Finally, what about HBS(HARVARD BUSINESS SCHOOL)? How's its feng shui? A: HBS has excellent feng shui! It faces a river that is flowing in the right direction. It will always prosper!